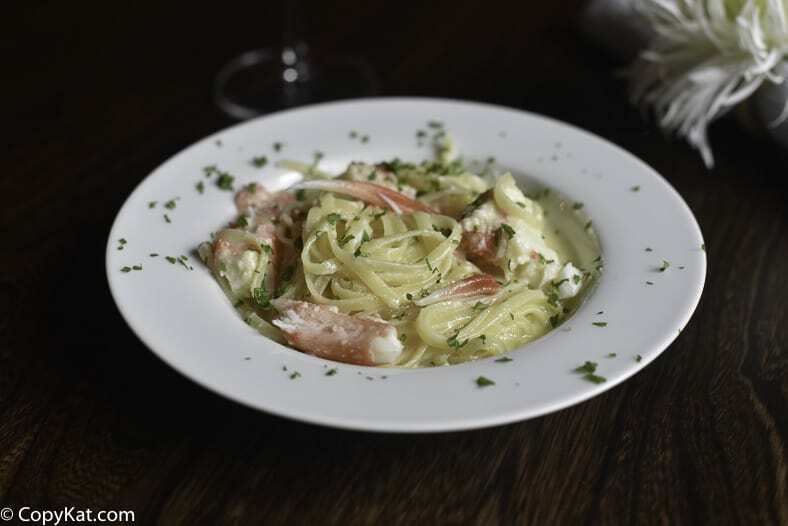 Red Lobster Crab Alfredo has been a long time favorite recipe at the Red Lobster. You can recreate this recipe yourself with this easy copycat recipe. Red Lobster is known for many menu items that everyone loves. 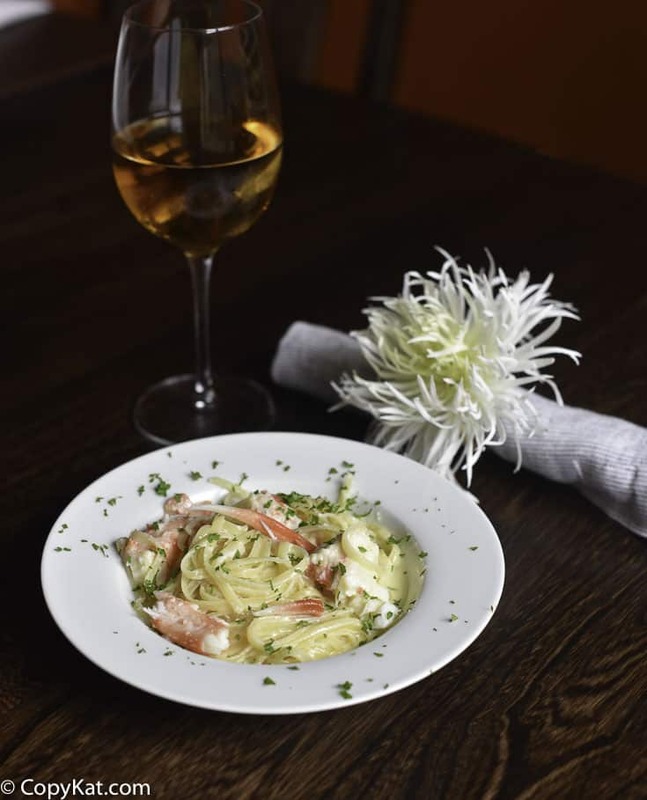 Fresh crab meat makes the perfect addition to this Alfredo sauce. You can use crab legs, you don’t have to buy the expensive Alaska King Crab legs, but there are many other varieties that will work well. You could use imitation crab meat if you desire. While this dish is a very easy and quick dish to prepare, I will say you should only make the amount of the Red Lobster Crab Alfredo that you will need to eat in one sitting. Typically Alfredo sauce and pasta do not reheat well after they have been combined. If you do need to save some for later, I would divide up the sauce and the pasta. Often the pasta will soak up the sauce once it is stored. I do not like the result of reheated pasta. There are lots of copycat recipes from Red Lobster you might like to try. Here are a few Red Lobster Menu Items you may enjoy. You can make Red Lobster Crab Alfredo at home. In a saucepan, melt butter. When butter is melted, add the cream cheese. When the cream cheese is softened, add heavy cream and the Parmesan cheese. Add garlic powder and stir well. Simmer for 15-20 minutes on low. You may wish to season with a little salt and pepper. Normally, cream cheese isn't used, but it does help thicken the sauce up without much difference to the taste. You can omit it--just be prepared to stay with the sauce a little longer to thicken it. Boil crab legs as you normally would in boiling water. Crack open legs, dab meat lightly with paper towel to remove excess water, and place the meats on top of the alfredo sauce and pasta. No use of flour in sauce? Is that correct? That is correct, this is not a roux based sauce. Recipes for crab Au gratin please. I will make this soon. I first ate Crab Alfredo at Red Lobster. It was to die for! I hope it will be the same as I experienced at Red Lobsters’. Please add me to your recipe list.LOVE!!! U never mentioned da pasta. How long i boil it or wat pasta I use. Omg!! I made the Red Lobster Crab Alfredo for a girls night gather at my house and it was a hit. Everyone could not stop raving about how great it was!